A few weeks ago our community was invited to “Mix and Mingle”, an event sponsored by Faith Connection in Toronto where young adults have the opportunity to meet with religious men and women. In preparation for the event, I was asked to provide the organizers with the “motto” of our community. This request led me to think that… well… we really do not have just one motto, do we? There are several expressions that we cherish, and that tell of one aspect of our charism or another. I began reviewing some of these expressions. “In Christo Jesu” (translates “rooted or founded in Christ Jesus”) are the first words of the Constitutions of our community. We sometime find these words as a signature in letters from our foundress or General Superiors. They tell of the core of our way of life: the life in Christ Jesus, which is the source of our apostolic activities. “Being available to the promptings of the Holy Spirit”, is another trademark statement, and it announces how we are called to be in our mission. “To find God in all things” is a well-known ignatian expression that describes the spirituality that we practice, and of our way of being contemplative persons in all that we do, even as we are immersed in the world. “Missionaries of the charity of Christ” is an expression that characterizes our community since its beginning (since its founding). Each of these expressions could very well be our motto. Which one should I choose to best respond to the request of the organizers of the “Mix and Mingle” event? 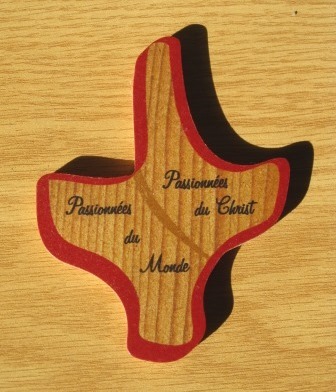 As I was pondering this, time passed, and before I actually replied to the organizers, they had picked from the french website of our community the title that can be found on the homepage: “Passionnées du Christ, passionnées du monde” to which a tentative translation would sound like: “Passion for Christ, passion for the world”. I was delighted to re-discover that declaration, and it gave me inspiration for the upcoming sharing with young adults: indeed, this expression tells of our sole desire to meet Christ and to meet the world, to meet Christ in the world, and as such, this is quite a fine motto!